I first came up with this idea because my friends and I always use this emoji when sending texts/snapchats. I knew it was going to be difficult to figure out how to keep the fake arm in the air all night, and I really enjoy a challenge. My friends said “There is no way people are going to know who you are.” CHALLENGE ACCEPTED! I wore it two nights and the second night I was at a mashup costume party (eg: The Incredible Hulk Hogan or LudaChrist). 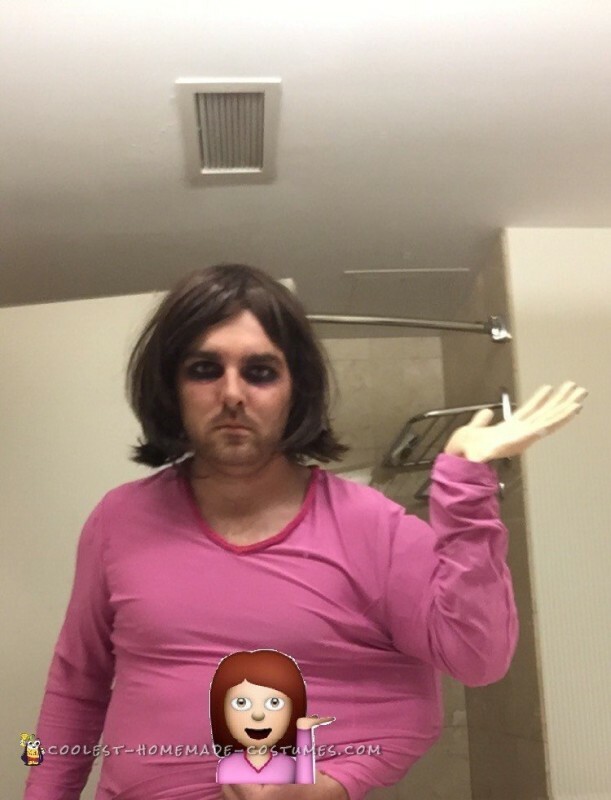 For the mashup I did EMOji Girl (in that picture I had on dark eye shadow/makeup to make myself look like the emo style that some kids are into these days). Making the fake arm that stays in the air all night and being comfortable at the same time was the hardest part of the emoji girl costume. 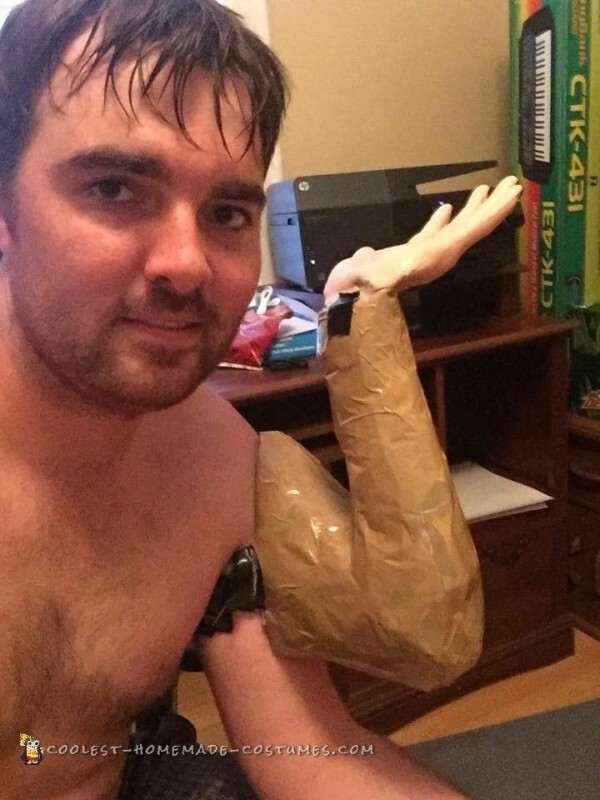 I used Styrofoam, duct tape, and bubble wrap to make the arm (same dimensions as my actual arm). I bought a hollow bloody plastic hand from the Halloween store and spent a long time rubbing the blood off with nail polish remover. I then boiled water and would put the wrist in the water for 20 seconds and then bend it (about 40 times) until it molded to the perfect 90 degrees so I could attach it to the arm. To keep the arm in the upright position all night, I attached it to my phone armband (which is normally used for running but making this costume was a workout in its own). I bought two pink shirts (from the women’s section at the thrift store) so I could have the light pink with the dark pink collar which I cut and sewed onto the other shirt. I bought a wig and straightened and gave it a haircut to match the girl in the popular emoji. 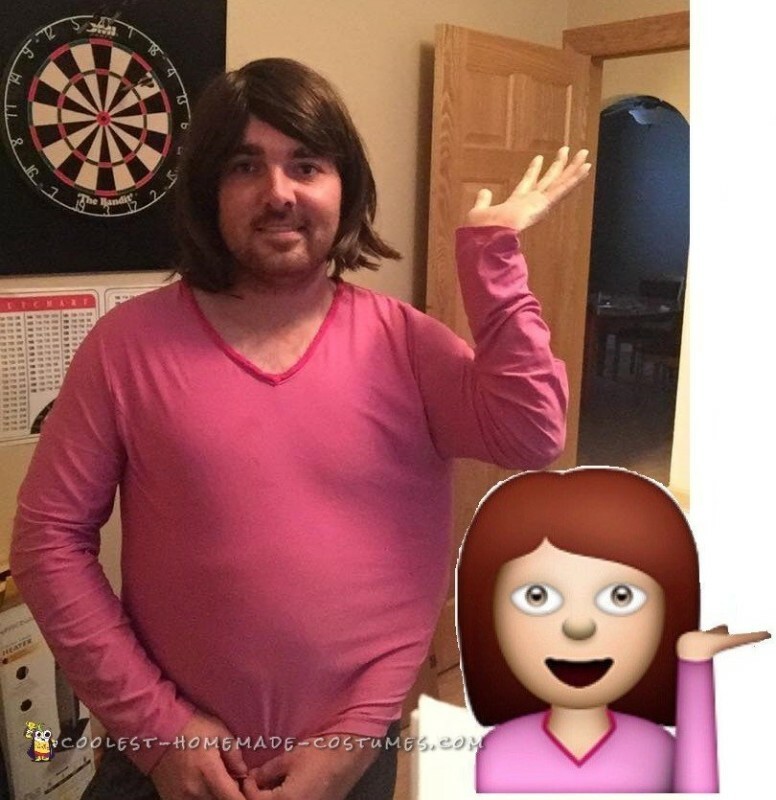 It was challenging to make this Emoji Girl Costume accurate enough for people to understand who I was without asking, and almost everyone knew who I was and gave me great feedback!